I have always lived under the illusion that Renoma was a home grown Malaysian brand, with some Westernified name, (okay, no such word, I know), but apparently, it's French, founded by Maurice Renoma, and if you don't believe me, read the french Wikipedia HERE. When I got the invite from Taufulo, I was rather curious, as to what this place was all about, and was even more intrigued when I saw the address was on Jln Bukit Bintang, which we all know, is PRIME real estate. Very bold, I thought, for a cafe to open at such a prestigious location, especially one hitherto assumed was a local brand. But well, they're French, so it's okay. It was easy enough to find, opposite Prince Court, and anyone with half an eye would not miss it, as it is rather prominent, housed in a huge compound, in what must have been an old house belonging to the old rich of KL. If walls could talk, I wonder what secrets the Renoma walls would reveal. This huge sign was there to welcome us. 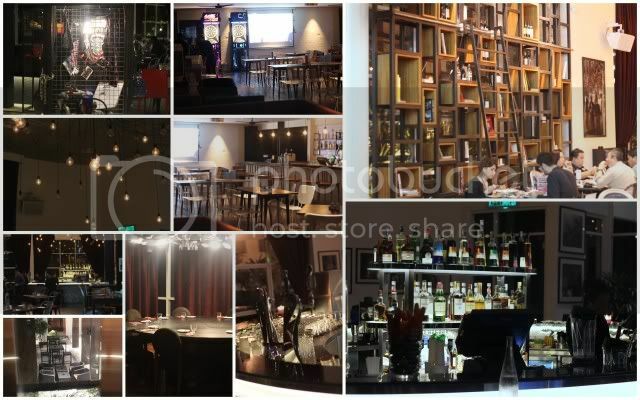 The place is rather swanky, with several autonomous regions, a VIP room, which is ideal for a private party, (think along the lines of stag or hen, ooh lala), an open bar with games and darts area, a proper dining area, numerous bars, and well stocked ones too. In fact, I was so enthused by the VIP room, I immediately recommended it to my friend who was looking for a private room for a hen's night. A minimum spend of RM3000 is required, and the place can fit 15 seating pax, and probably up to 30 if they mill around. The VIP room is decorated with plush sofas, dining table, ...all very nicely padded up. Oddly enough, THESE babies were served first, not sure why. 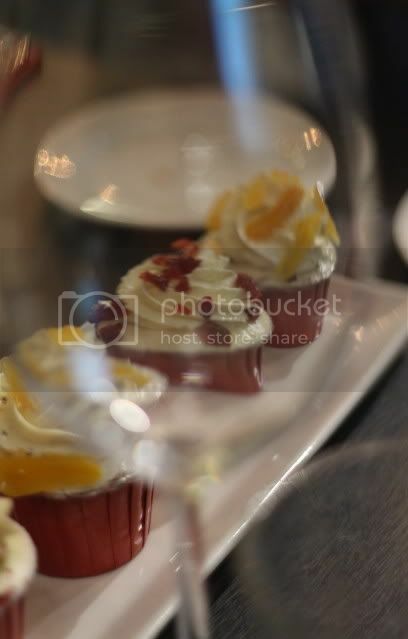 Red velvet cupcakes, and two other signature cupcakes. I initially thought maybe it was a savoury starter...disguising as dessert. Their rather elegant house wine, (not house pouring, but house as in signature), which I believe is RM250 a bottle. 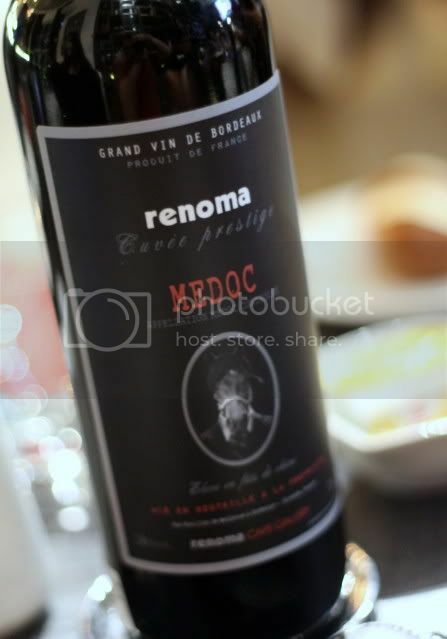 A full bodied merlot, apparently made specially for Renoma. 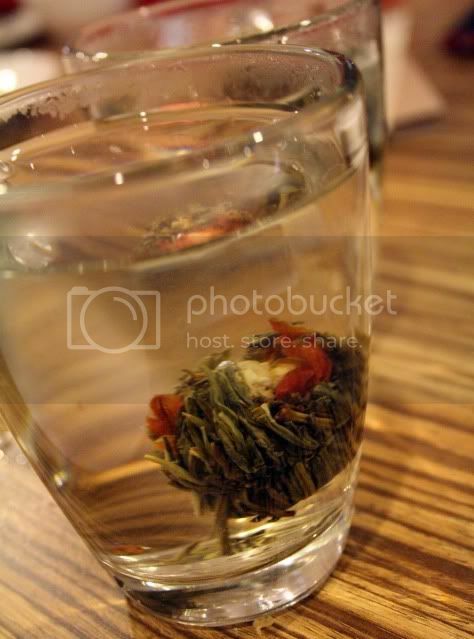 Easy to drink, with a lovely bouquet of fruits and tanine. 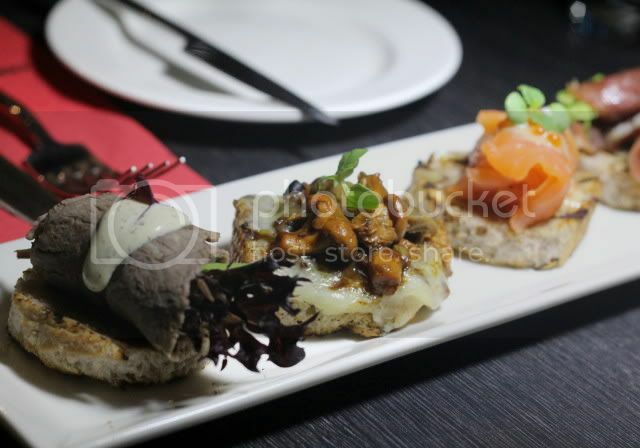 Assorted canapes, covering sea, farm and forest...In case the visual is insufficient, the beef roll would be farm, the mushrooms forest, and the salmon sea. 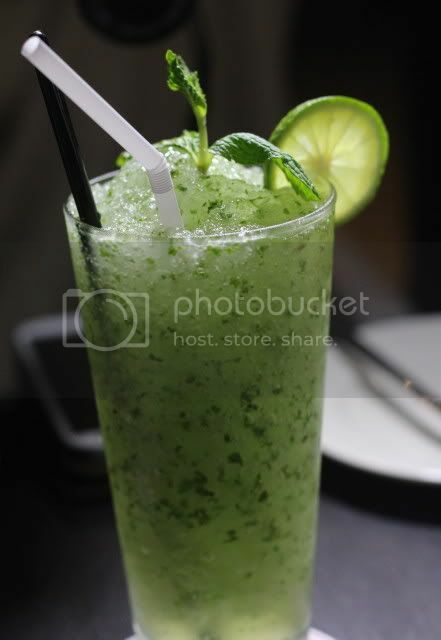 Classic Mojito, lovely refreshing dash of rum in lime juice and mint leaves crushed to impart that wonderful flavour. 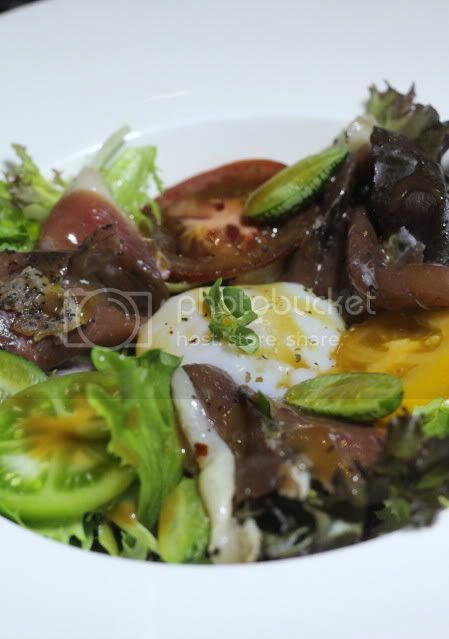 Cured Muscovy Duck Breast salad, which I thought was lovely, and I loved the poached egg in the centre. I have this thing for eggs, so in my book, it's difficult to botch up anything if your eggs are perfect. The cured duck breast is tender, and smokey. 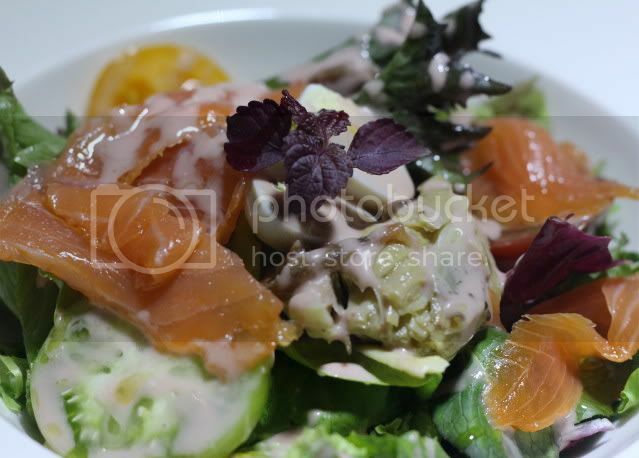 Nicoise Salad With Smoked Salmon - Crunchy salad, with rich dressing, and slivers of smoked salmon. Probably can pass off as a health dish, if it wasn't for the rich dressing. 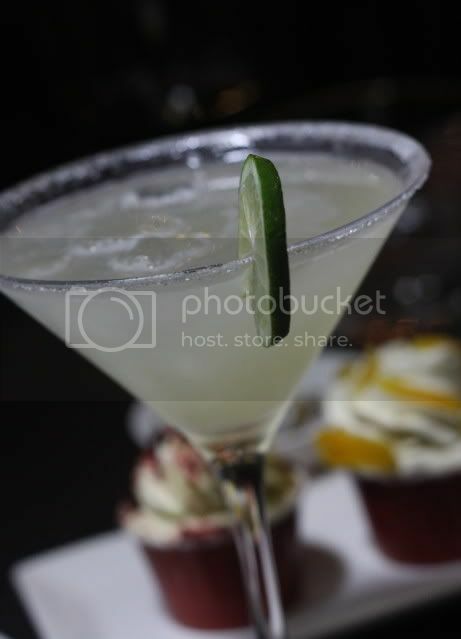 Their signature margaritas... I didn't try it, so I wouldn't know, but you can read all about it at Taufulo's blog post HERE. Ah, the piece de resistance for the night, in my opinion. 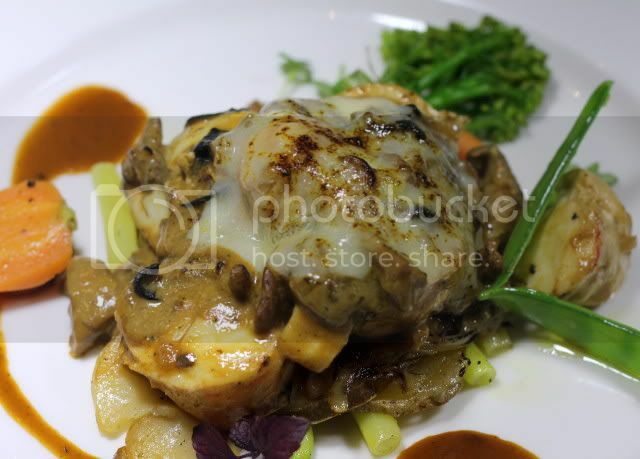 A decadent 120gm slab of foie gras, at RM78. Melt in the mouth foie, seared to perfection. Actually I would have opted for this as a main course, and it would have been more than sufficient. Of course, inevitably, a debate raged about the "cruelty" involved with foie gras etc. But I'd like to think that geese roaming free and having plenty to eat isnt the worst thing. Anyway, if you really want to be pedantic, then vegetarianism is the way to go. The Lobster Bisque, a very nice thick broth, and generous chunks of lobster unlike some places where you'd be lucky to get a hint of lobster in the bisque. 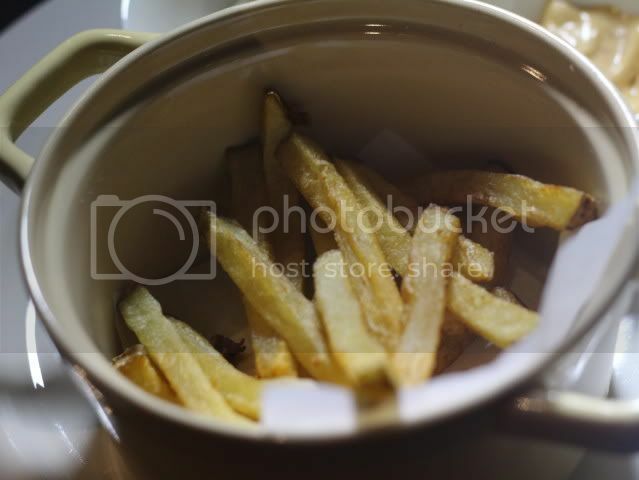 This dish screams out for good bread and butter to make sure there is nothing left in the bowl. 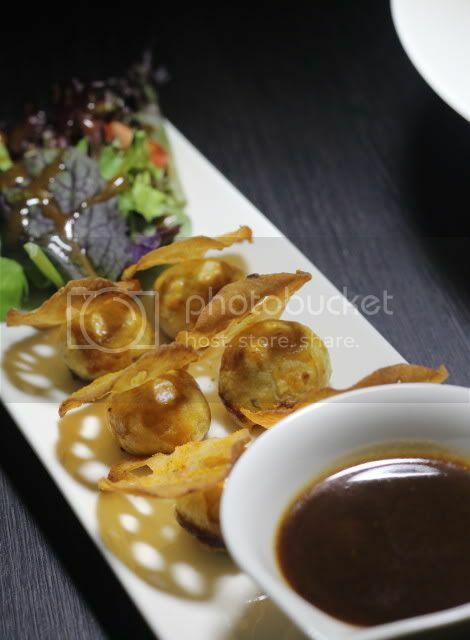 Mini Snail parcels, escargots wrapped in puff pastry, decorated with lotus root, that totally camouflages the slugs, but very pretty. I didn't try this, so I can't say anything. 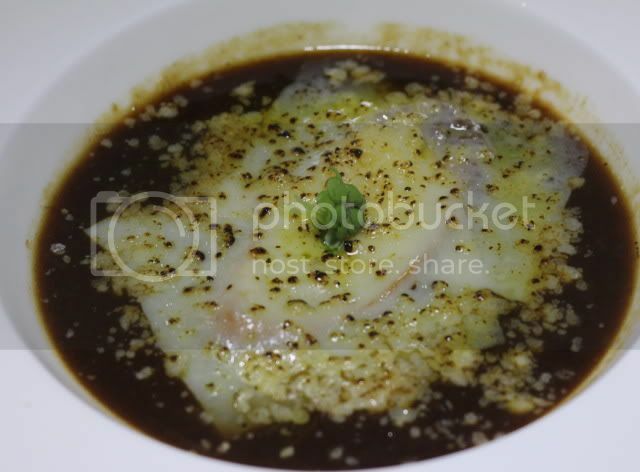 French Onion soup, with a generous helping of melted cheese on top. A very hearty soup, and actually the cheese fills you up, so despite the relatively dairy free soup itself, it is rather rich. 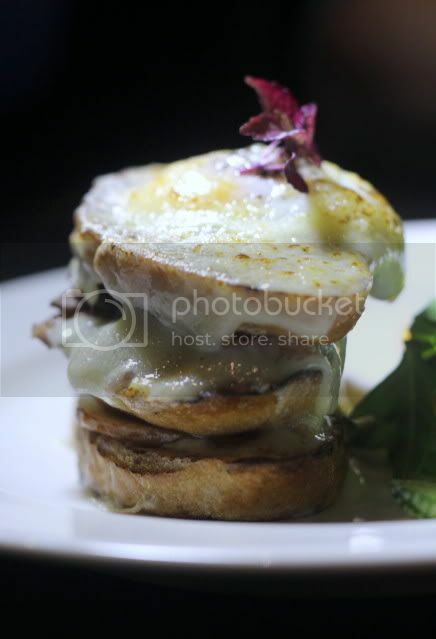 Croque Madame, (though I love to say Croaked Madam). Essentially, the difference with a croaked madam, and monsieur, apparently, is that the former is served with an egg, as befits a woman. Did I say the foie gras was the height of decadence? 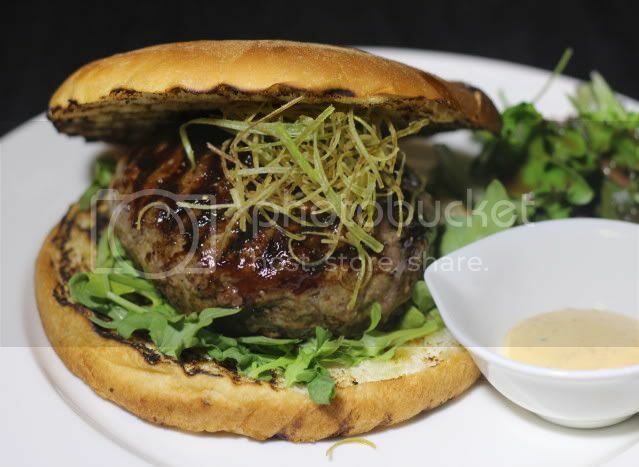 Well, this duck foie gras burger is a close second. Ground duck meat, enveloping a CHUNK of foie gras within. Gosh, bring out the Lipitor...but oh so good. Melt in the mouth, a carnivores dream. Look at that cross section! Swoon! Faint. 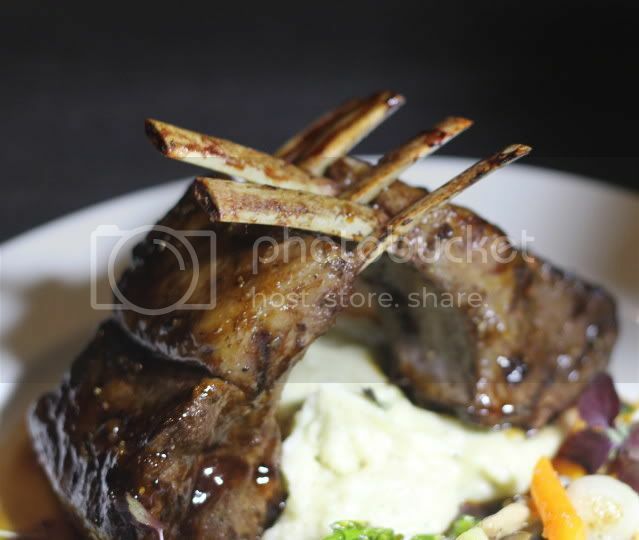 Oriental Rack of Lamb. 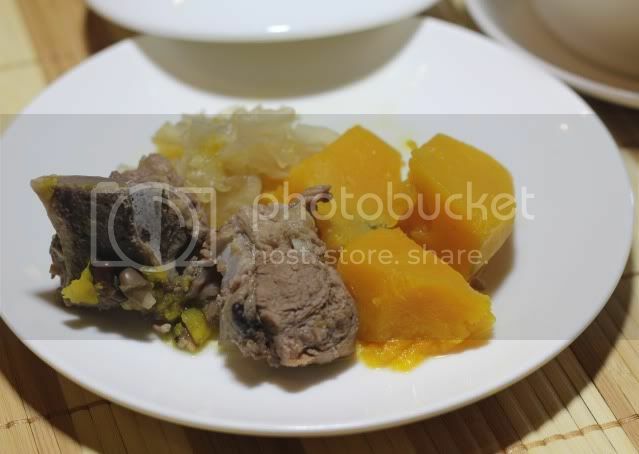 Though Taufulo waxed lyrical about this dish, I have to say that in my old age, I am not a lamb fan at all, and didn't try this. But the general consensus by those who did have it was a thumbs up. 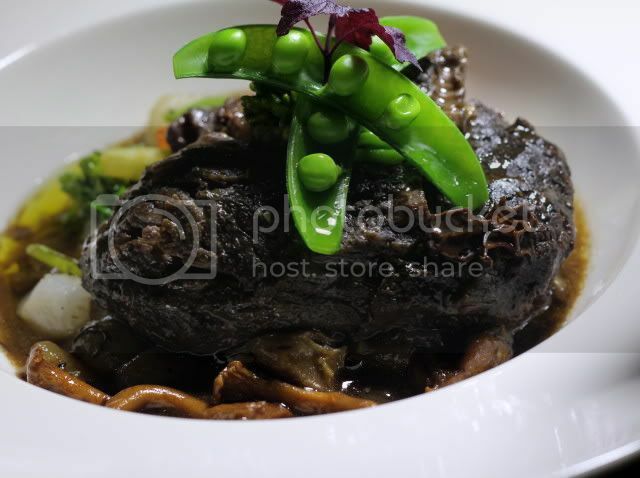 Bouef Bourguignon, (I can imagine Julia Child saying this), ..using beef cheeks, imparting that slightly gelatinous texture, but falling off the bone, and most tender. At RM58, this is a steal for the bovine fans. 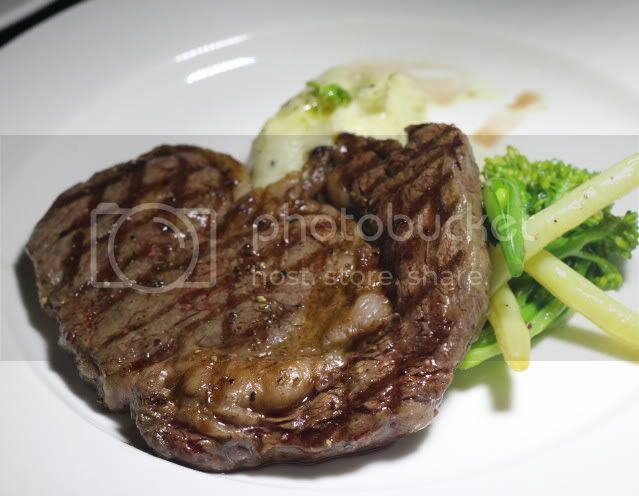 Ribeye Wagyu, 220gm for RM128. Very reasonable, I reckon. Love the marbled meat, and the sheer tenderness of it, melts the heart as well. (after clogging it). 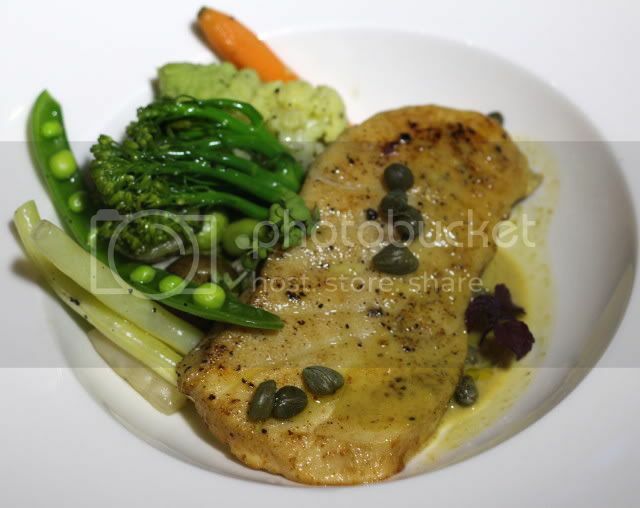 Cod Meuniere, RM62- Wild Caught Cod Fish Fillet Poached in Brown Butter, Seasonal Vegetables, Capers, Kaffir Lime Leaf, Lemongrass & Orange Maître d’hôtel Sauce. Actually quite reasonably priced for COD. 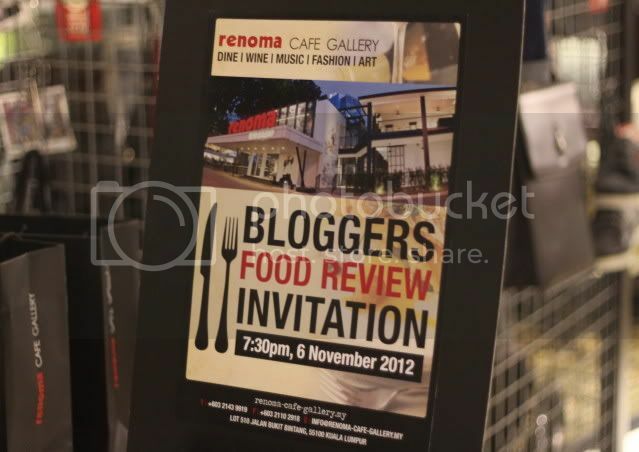 Honestly, I don't know HOW bloggers can eat so much, I was really stuffed by this time. For some reason, I thought this was pigeon, and even posted in my facebook that it was, but obviously I was mistaken. It's actually Coq au Vin ( Burgundy Style Spring Chicken) at RM36 - Maybe it was the size of the spring chicken that made me make the pigeon mistake. 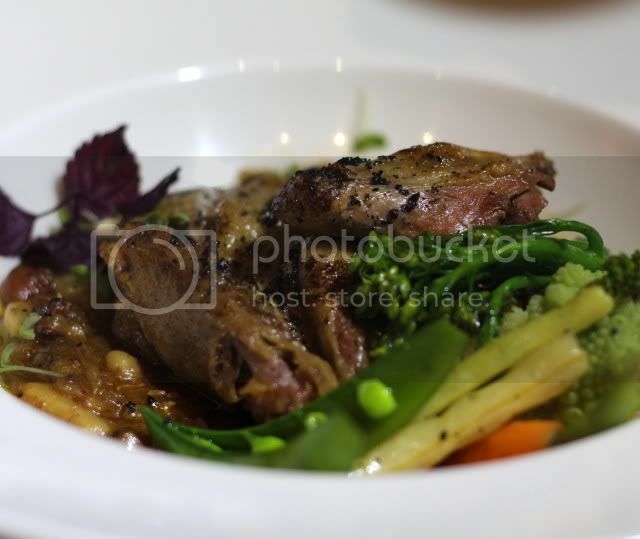 The young chook is braised in burgundy wine, and served with a wide array of vegetables. 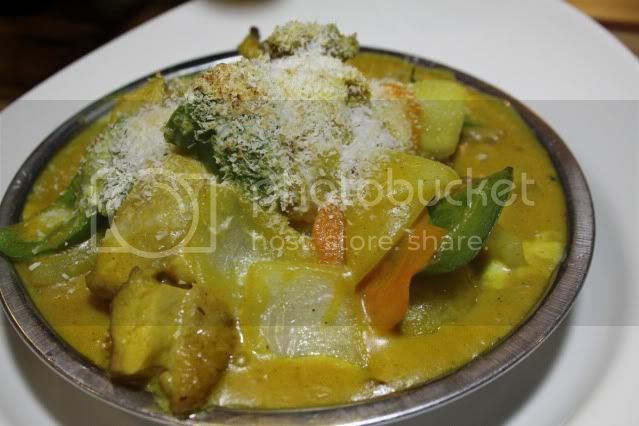 Ah, yes, one thing that really stands out at this place is the gorgeous side vegetables that the chefs so painstakingly prepare. Not only are they pleasing to the eye, but all taste delicious too, and very unique. Not your ordinary run of the mill chunk of brocolli and spinach. Okay, this was my own main, lobster thermidor, which has been deconstructed, as we who ordered it were expecting the lobster to come in its shell. 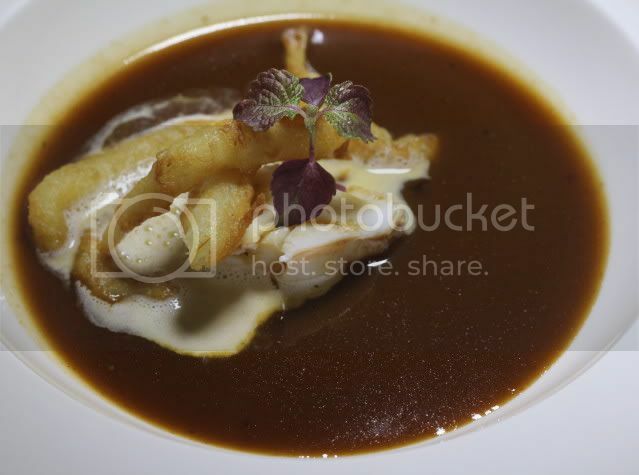 Medallions of lobster drowned in thermidor sauce, which is a bit gratinized, and a bit salty. 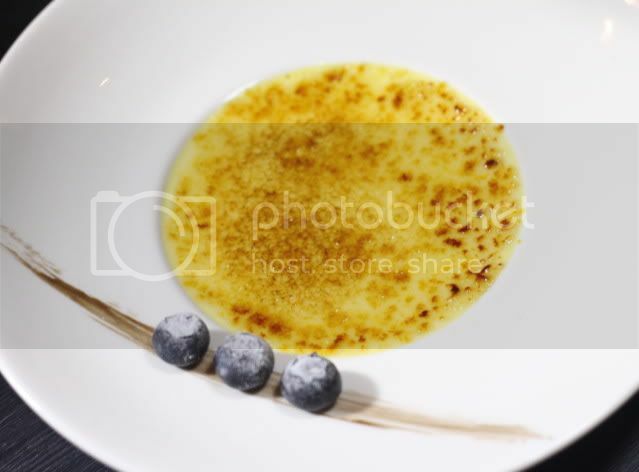 Creme brulee, orange vanilla flavoured. Silky smooth, with that lovely crackling of caramelized sugar on the surface. 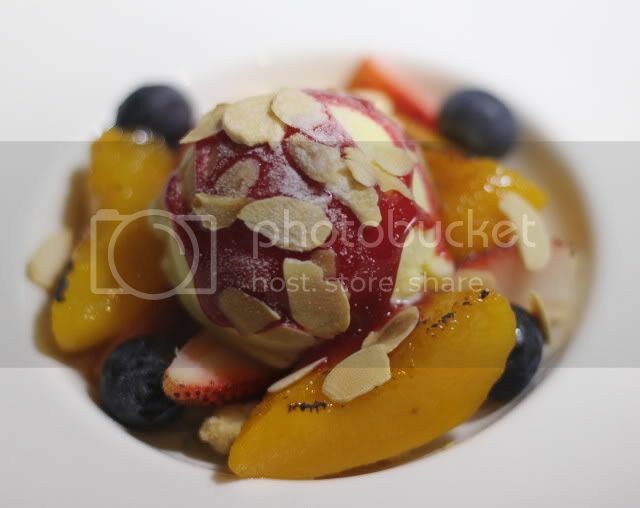 A beautified take on traditional Peach Melba. 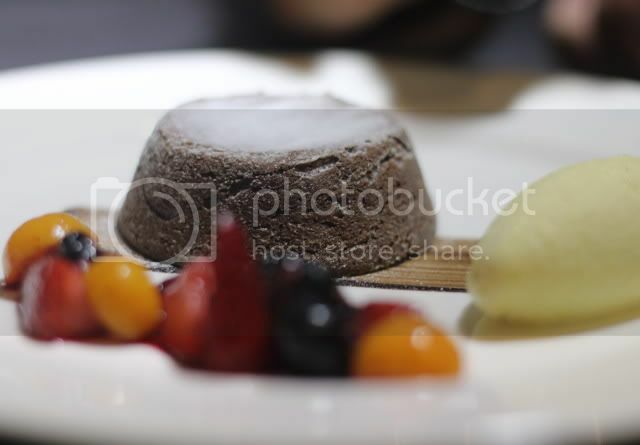 Valrhona Chocolate Fondant, with the oozy centres, accompanied with a side serve of ice cream. 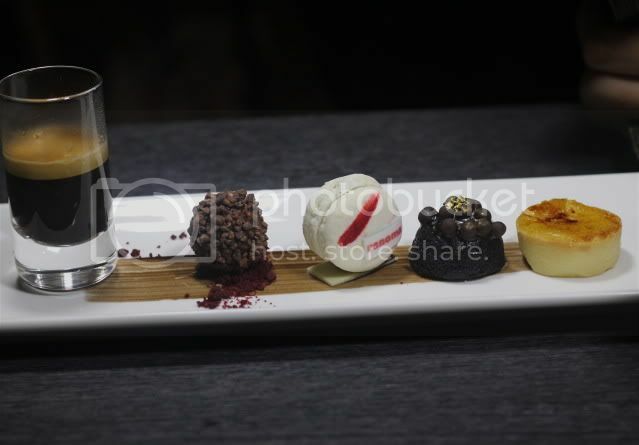 Le Cafe gourmand, an espresso shot (which would keep me awake all night), and four of their signature miniatures. Macarons, mango mille feuille, etc. 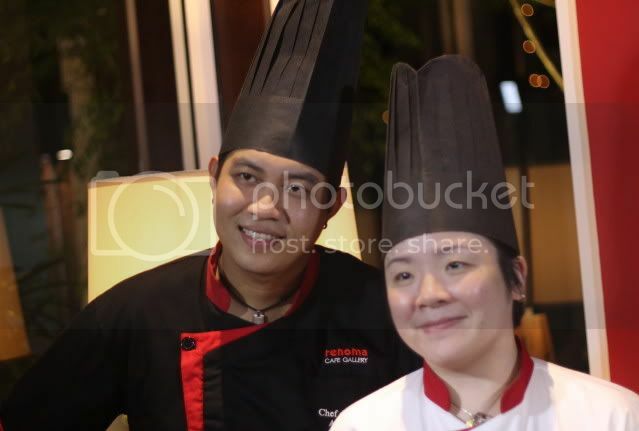 Chef Alven Tan, Chef de Cuisine, and Chef Amanda Lim, Chef Patisserie, make an appearance at the end of the meal, to receive the kudos they so deserved, and also some feedback on the saltiness of certain dishes. Singapore, 5 November 2012 - With Sundown Festival 2012 pulling all the stops to bring in leading acts from China, Japan, Korea, Hong Kong and Taiwan, the F1 Pit Building at Marina Promenade is proving to be the place to be, rain or shine, on 1st December. Sundown Festival is an annual event that celebrates Asian music and culture, with the aims of not only showing the best and most vibrant of Asian entertainment but also to unite and bridge the cultural diversity of Asia. Each year a new Asian country will be added to the list of performers, creating a snowball effect to the festival in order to generate hype, anticipation and captivate audience. The Festival will feature some of the most popular and up-and-coming musicians, on top of their cultural exports (such as food and other consumables) through fringe activities and stalls set up at the event grounds on the Festival day itself. Sundown Festival started in 2009 with the theme Seoul’dOut!, when it focused on Korean music and culture and single-handedly caused an explosion of interest all things Korean (also known as the Hallyu wave) in Singapore. In 2010, Japan was added to the performance line-up, giving rise to the popularity of J-rock and visual kei youth pop culture. Taiwan was added to the mix in 2011, prompting new Asian entertainers and industry players to make Singapore as its maiden stop of fame. Today, Sundown Festival continues to play the role as the purveyor of all things Asian, turning the world’s spotlight to this part of the world and in its course hopes to unite culturally diversified Asia through music. The ultimate goal is to culminate all efforts to give rise to Sundown Festival World Tour of all 11 Asian countries, beginning in home soil Singapore. 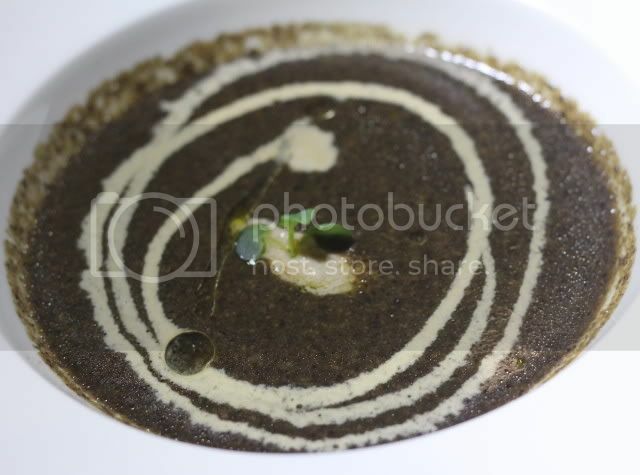 With a name like Private Kitchen, images of underground supperclubs spring to mind, and I half expected the venue to be in someone's house, and since the invite came from PureGlutton, (read her review on the link) I thought it might be at hers. 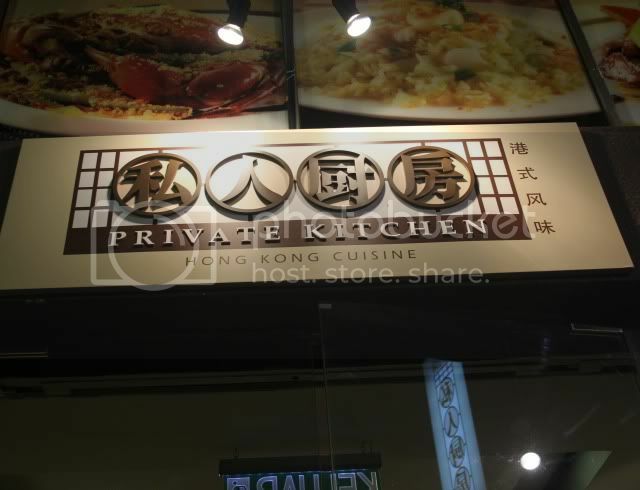 As it turns out, Private Kitchen is in Damansara Uptown, next to the famous Koon Kee wantan mee, and really, is quite hard to miss. I was late, so I understand I missed out on some dishes, as the ravenous food bloggers cannot wait 10 minutes without eating. Drat. Anyway, I was in time for this lovely soup, a hearty, wholesome broth with pumpkin and pork ribs. Perfect for our current wintery weather. 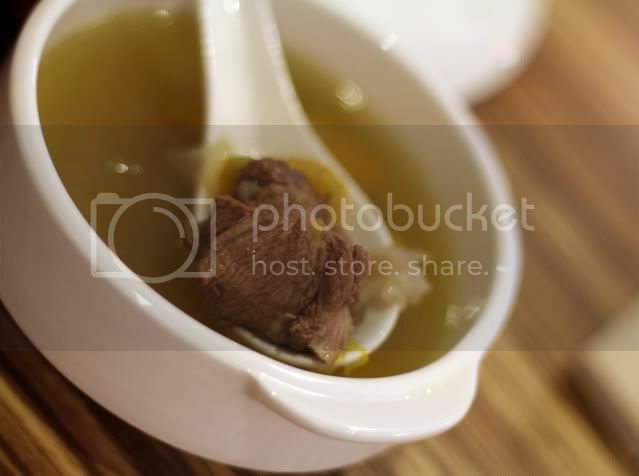 Sometimes with soups, the meats are boiled until they are left with the flavour of blotting paper (sigh, I've actually come across youngsters these days who ask, "what IS blotting paper"), but the meat left in this soup is still flavourful and tasty, and tender. 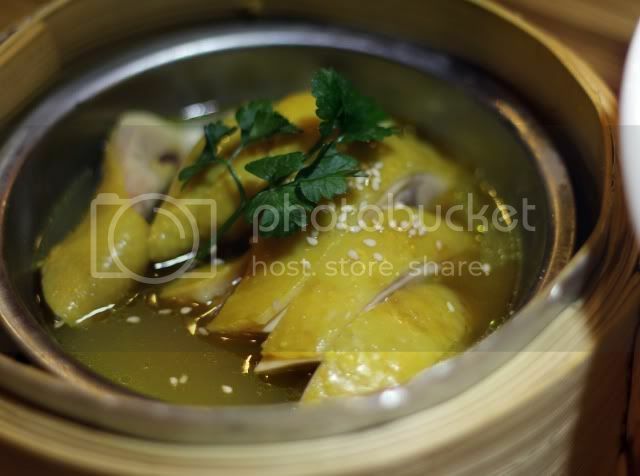 How can one fall in love with such yellow skin, the epitome of the Chinese steamed chook. 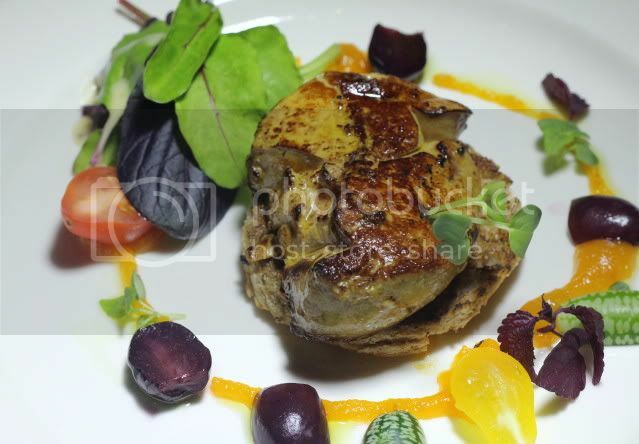 Of course, the colouring is not naturally so yellow, but is aided with tumeric, as the chicken is cooked in tumeric. 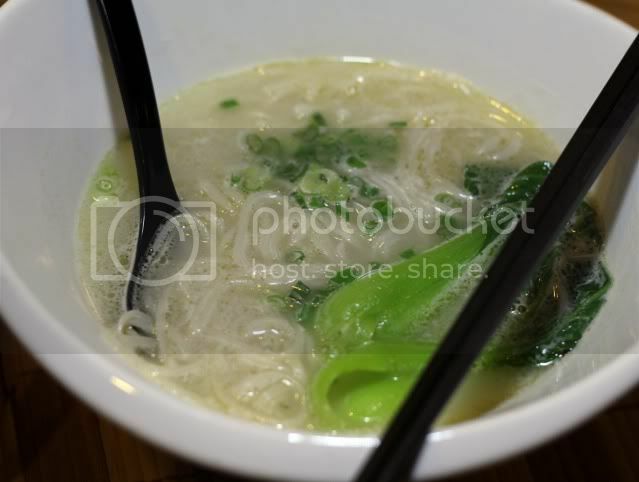 The chicken is actually an accompaniment to this noodles in soup, but really, the clincher for this dish is the fabulous sand ginger condiment it is served with. 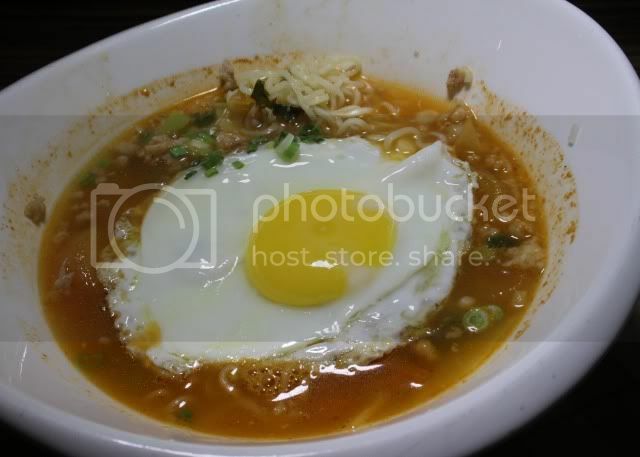 Noodles with fried egg and minced meat in tomato soup. This may LOOK like something you'd cook from a packet of Maggi, but it isn't. It is however the ultimate comfort food. Actually these are the lunch menu items, in case you are gawking at the thought of this for dinner. Typhoon Shelter noodles with Pork Chops. Hitherto, I did not know typhoon shelter was a place in Hong Kong. The pork chops are good enough on its own, and actually rather generous for a lunch portion. 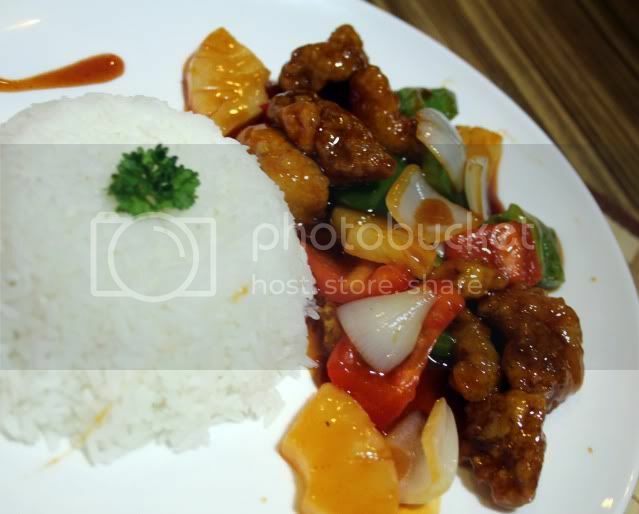 This looks like sweet sour pork, tastes like sweet sour pork, but for some inexplicable reason, is called "stir fried pork" with rice, in the menu. 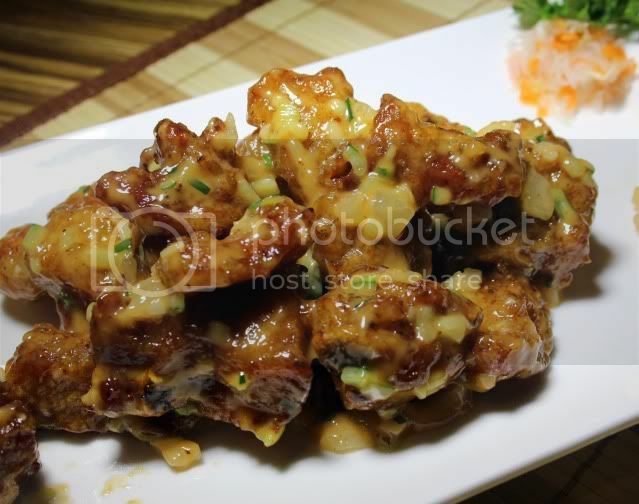 The pork masters, ie, Ken of FOODPOI and Taufulo, give it the thumbs up, as far as sweet and sour pork goes. 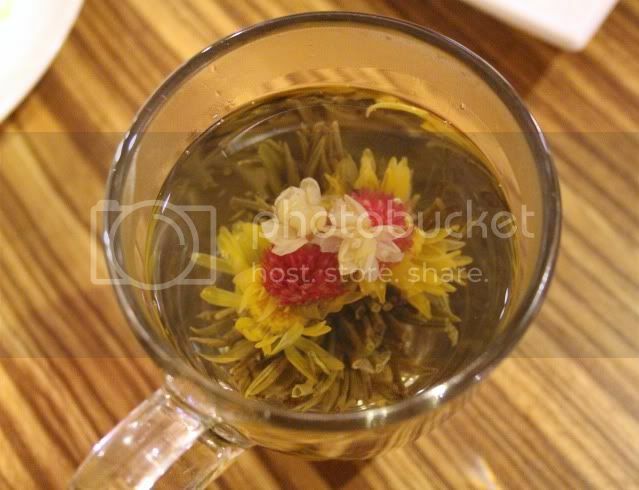 Bangsar Babe, who baffles me with the sheer amount of food she can ingest in the miniscule frame, imbibes this very picturesque flower tea. 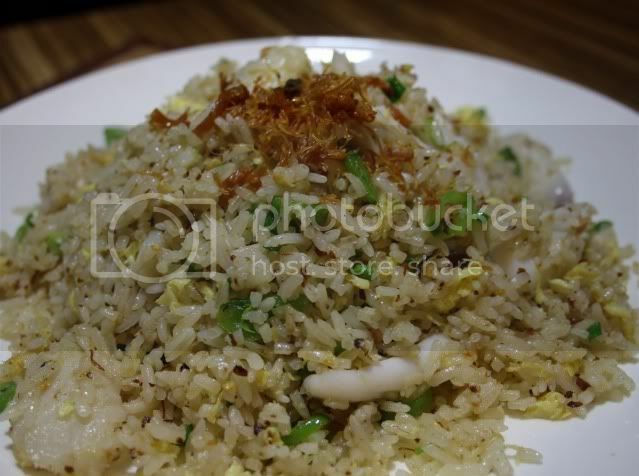 Private Kitchen fried rice with seafood and XO sauce. 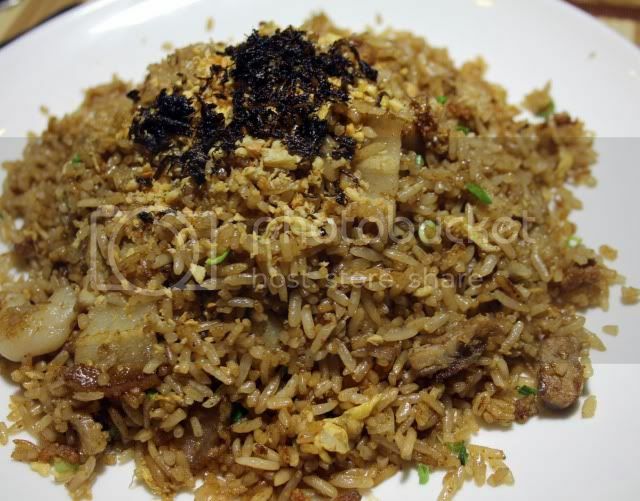 Good old traditional fried rice. I would have preferred it with a bit more porky stuff. 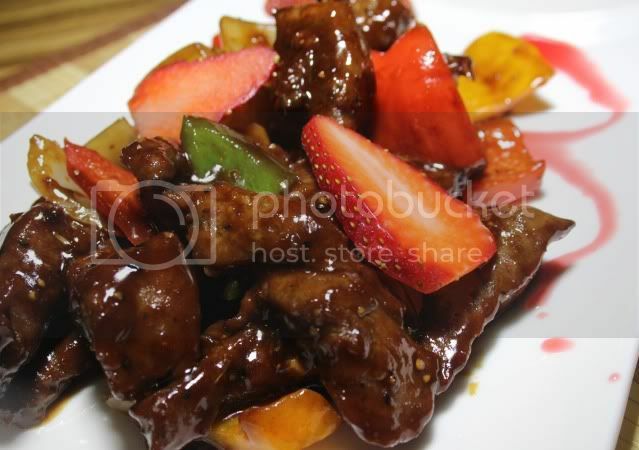 Strawberry Beef. A strange marriage that actually works. 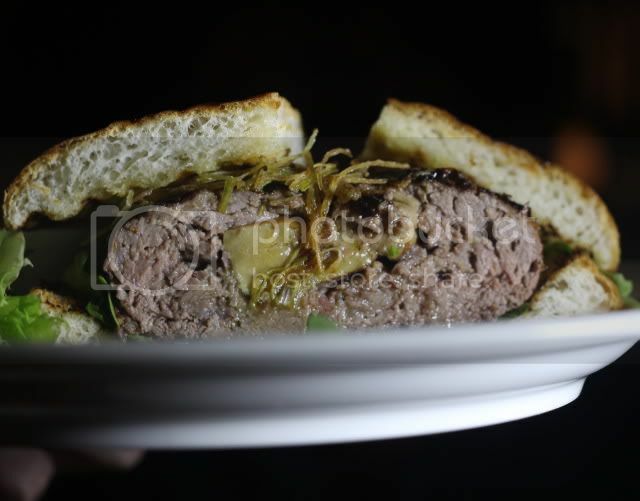 The beef is supremely tender though, which makes me wonder what the chef did to achieve such tenderness. 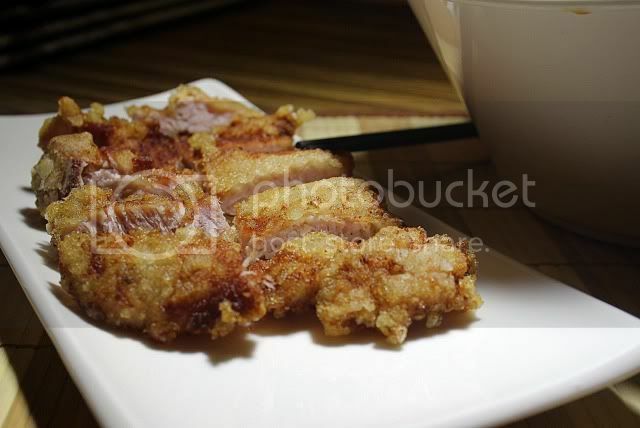 Deep fried pork ribs with special salad sauce. Definitely something I'd order for dinner. Unfortunately this dish screams out for rice, and we all know rice at dinner is the enemy. I kid. We are Chinks, bring on the rice. Stir fried squid with Vermicalli, in special chilli sauce. 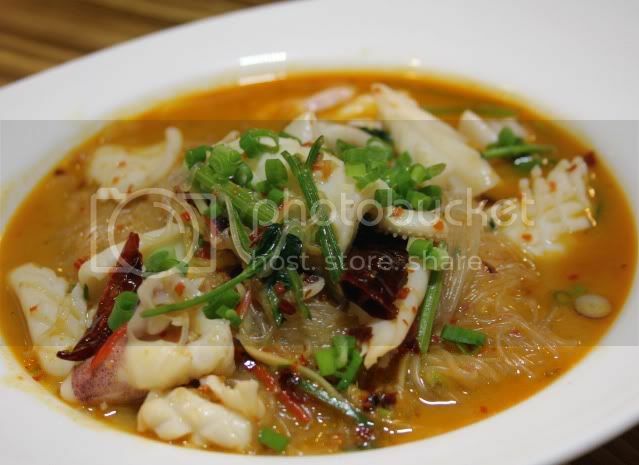 Tangy, spicy, and the squid very fresh.. 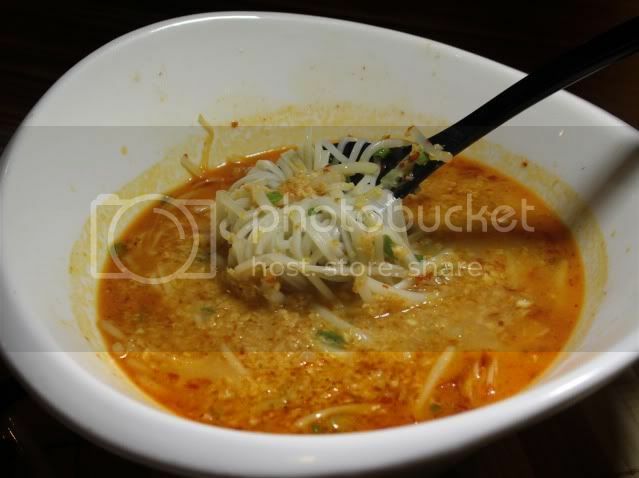 However, this dish needs to be consumed fast, because once the vermicelli soaks up all the liquid, it can get rather stodgy and is not as palatable as when freshly served. 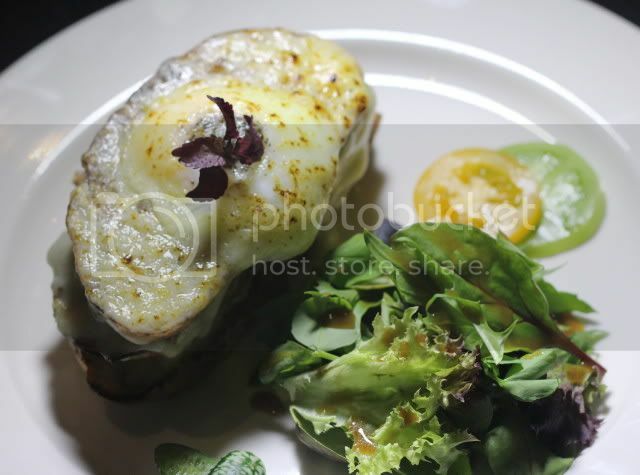 Portuguese style baked chicken chop. A very distinct curry powder taste. 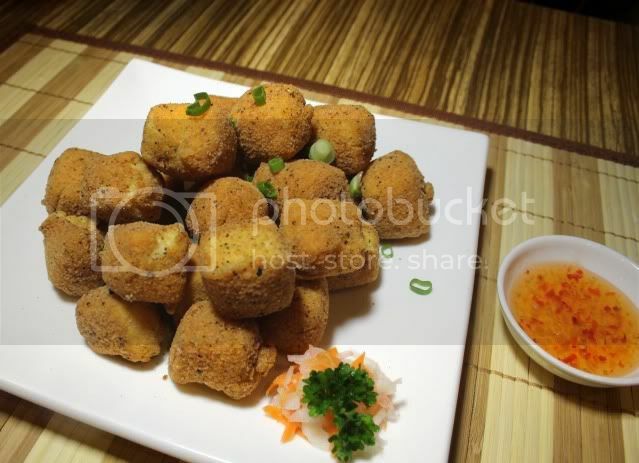 Deep fried tofu with salt and pepper. The perfect beer food. On its own, the salt batter is a bit too salty. 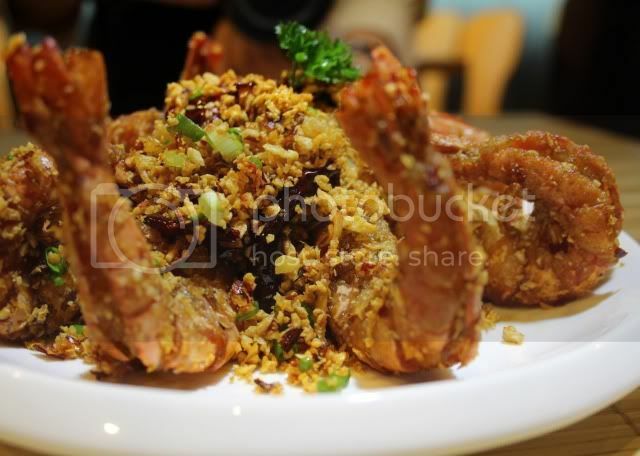 Some encore dishes, Typhoon Shelter garlic fried tiger prawns... honestly, food reviews can be such health hazards when generous hosts insists on force feeding you like a foie gras goose ...I was really too stuffed by this stage. Apparently Typhoon Shelter style is distinct because of the inordinate amount of garlic and spring onions. 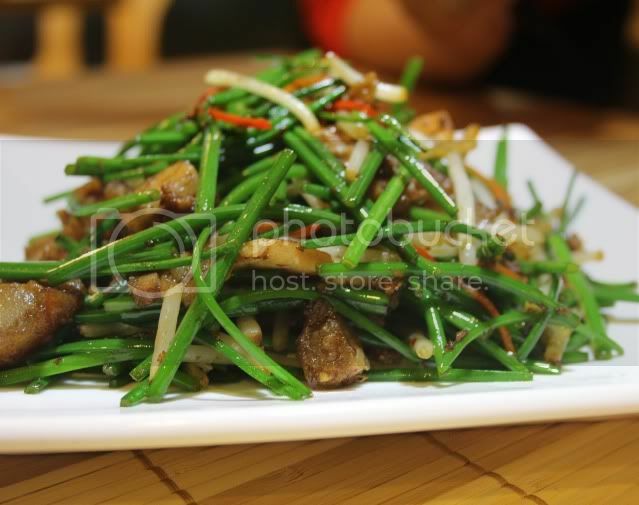 Chives with Siu Yoke. The token greens for the night. A great combination though. 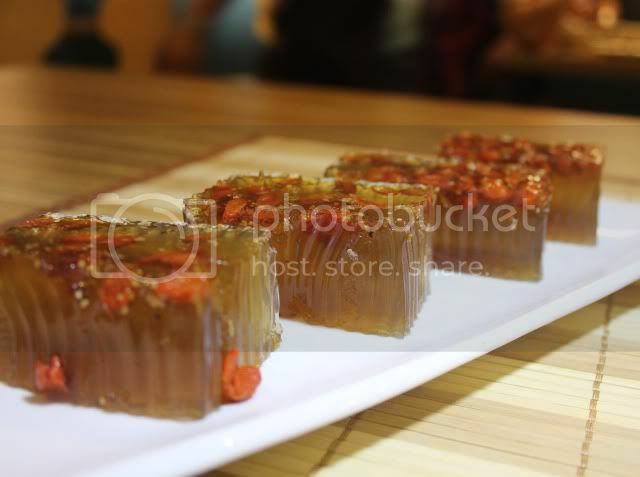 Osmanthus jelly with Kei Gee, (wolfberry), a typical Hong Kong dessert. Chef Lam Fai from Hong Kong. 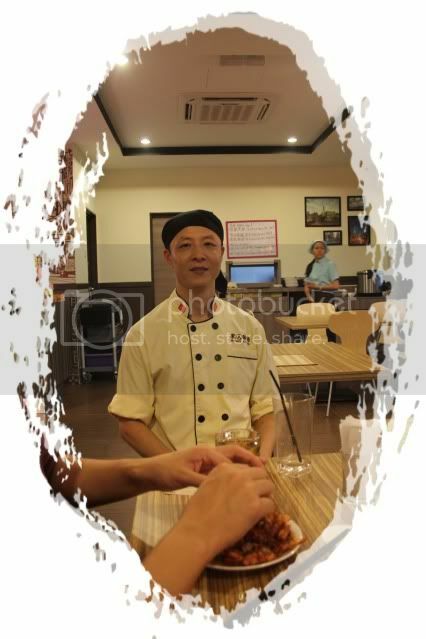 Very soft spoken (at least it appeared so), and earnest in his explanation of his dishes. Special thanks to Jacqui Yap for having us, and taking such good care of us.